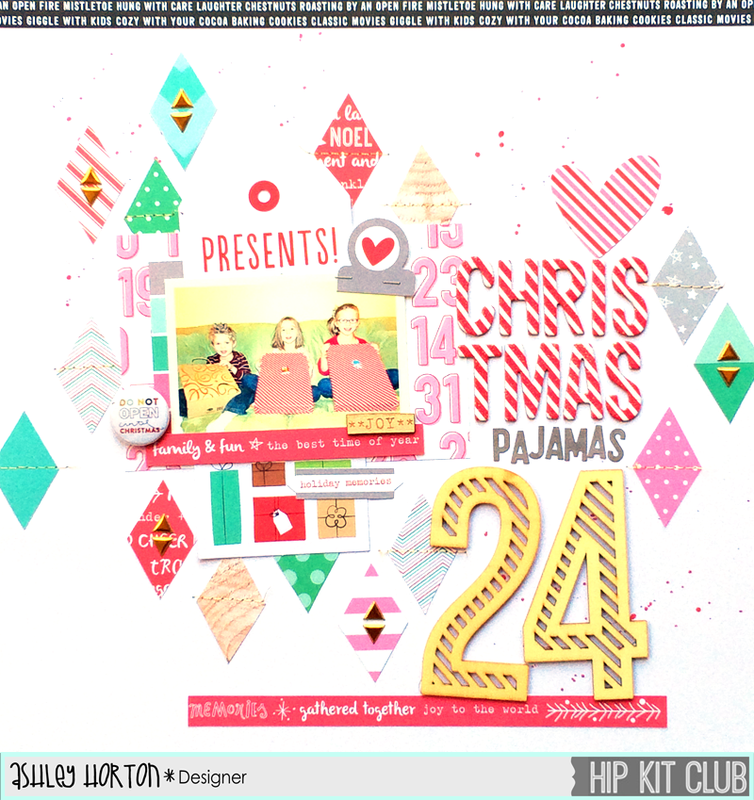 I'm so excited to share my first layout and card, using the November 2014 Hip Kit & Add-On Kits from Hip Kit Club! This month's Kit will definitely get you in the Christmas spirit and if you're looking for even more Christmas fun, then make sure you check out the December Documented 2014 Kit. There are so many fun papers and embellishments included in this month's Kits, and I couldn't wait to get started on my first layout! 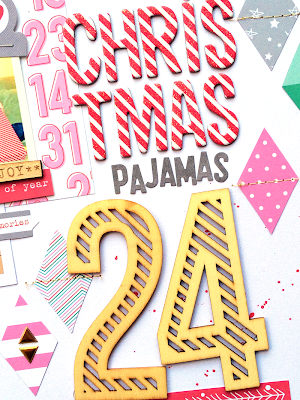 The Holiday Quilt patterned paper from Elle's Studio, just had to be fussy cut! I used the diamond shapes to create the background look on White cardstock, from the Cardstock Add-On. And I wanted to incorporate the Evalicious Gold Misc. Shapes, so I added them as a second diamond pattern to some of the fussy cut shapes. I used one of the large tags from the American Crafts Decorative Tags pack and layered it behind my photo. To balance out my page, I added the large Studio Calico wood veneer numbers for the date of my photo. And I finished my page by adding some splatters of spray mist! 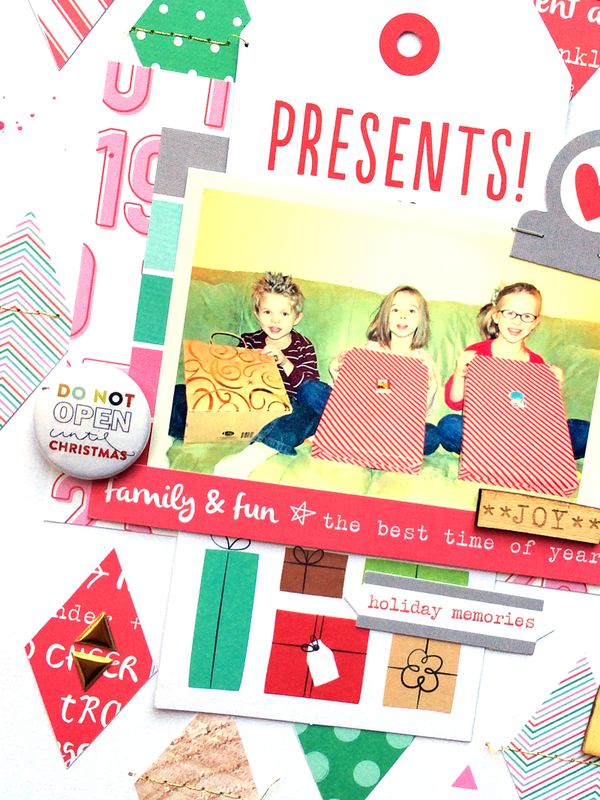 The November 2014 Hip Kit & Add-On Kits are perfect for creating Christmas cards. I started with a Red cardstock base, from the Cardstock Add-On Kit, and then covered it with the Elle's Studio Countdown patterned paper. I wanted to add some interest to the background of the card, so I made strips using some of the Elle's Studio patterned paper, Pebbles patterned paper and American Crafts Glitter Tape. Then for some extra shine, I used the Studio Calico star rub-ons, before adding one of the American Crafts tags, to create my card sentiment.